Take a sunset walk along the South Rim of the Grand Canyon, considered one of the Seven Natural Wonders of the World. Watch the vivid colors set the sky ablaze as evening descends over the vast canyon. This 10-hour excursion departs around midday from Flagstaff and includes outstanding overlooks, a stop at the Cameron Trading Post, and dinner at the historic Bright Angel Lodge. The photo ops are endless. After hotel pickup, you’ll follow a scenic route from Flagstaff via State Route 89A, passing tall pines against a backdrop view of the San Francisco Peaks, a volcanic mountain range. Marvel at the hues of the Painted Desert as you enter the Navajo Nation. Your guide makes a stop at the Cameron Trading Post, established in 1916. Browse for American Indian arts and crafts of the Southwest and grab lunch or a snack (own expense) while enjoying views of the Little Colorado River Gorge. Your journey continues on to Grand Canyon National Park, where you’re treated to a variety of overlooks that demonstrate the canyon’s play of light and shadow. Observe the colors change throughout the afternoon. Upon arrival at Grand Canyon Village, you’re treated to a delicious dinner at the historical Bright Angel Lodge, located at the South Rim of the Grand Canyon. After dinner, join your guide for a sunset walk along the rim. 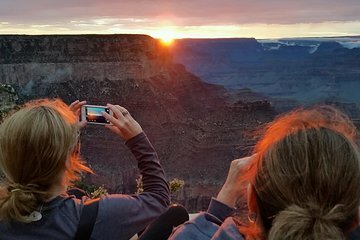 Photo ops abound at two scenic viewpoints that show off dramatic sunset colors across the vast chasm; you can focus your lens all the way to the North Rim. Once you watch the sun dip on the horizon, your guide will transport you back to your hotel. Lynn was the BEST!...very informative and passionate about what she does. We learned so much... not only about the Grand Canyon but other very interesting facts during the drive up to the GC and back home. Thanks so much Lynn!! Great tour brought us to different areas away from the crowd gorgeous views. At sunset we were in the perfect place to see a beautiful sunset over the canyon. Dinner meal was great as well. Highly recommend this tour. Would recomend this for first time visitors to the canyon , our guide was very knowledgeable and made our visit wonderful!!! The sunset was absolutly awsome!!!! !